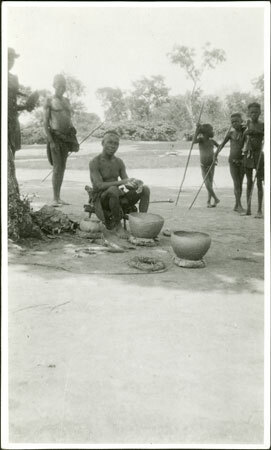 A potter (identified as Iowa) sitting in an open area in the shade of a tree with two unfinished pots resting on leaf ring supports in front of him, with children carrying sticks looking on. Notes on print/mount - "Iowa makes pots. 72/1 I-3 EPA692"
Notes on card mount m/s pencil - "SS upper RH & LHS 'Iowa makes pots' 8.89"
In The Azande (OUP, 1971) page 95, E. E. Evans-Pritchard notes that "Azande men are expert potters, or so it seemed to me, for I attempted, without much success, to master the art under their guidance. This is said to be an art of the Ambomu, who made certain types of pottery... used for carrying water, ablutions, brewing beer, boiling oil, roasting and boiling met, etc. On the whole it was asserted that small-mouthed pots were Mbomu and that designs with larger mouths came from the south, especially from the Mangbetu." Morton, Chris. "Zande pot making" Southern Sudan Project (in development). 03 Jan. 2006. Pitt Rivers Museum. <http://southernsudan.prm.ox.ac.uk/details/1998.341.692.2/>.